These two salads are delicious anytime of the year, but since they’re red and green they’re especially great for the holidays when you want something healthy and festive to balance all the sweets. I love how simple and flavorful both of these salads are – they both have a mixture of great textures, too. Both mix a bit of creamy (avocado or feta) with crunchy (celery or walnuts) and bright fruit flavors (pomegranate seeds or dried cranberries). There’s nothing wrong with a standard spinach & strawberry salad with balsamic vinaigrette too, but these will bit a bit more memorable. The avacado salad is from Chile and the cookbook I found it in – Maria Baez Kijac’s excellent The South American Table – notes that it is traditionally served at Christmas with turkey and most people put walnuts in it but the author likes fresh pomegranate seeds for their bright color and crunch. The kale salad is known in our family as “Denise’s salad” and looked for at potlucks, where we know it’s namesake will bring it and make sure it’s made with the best possible ingredients. 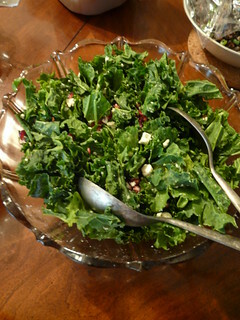 Many people who’ve never really tried kale before love it when they try this salad and they often request the recipe later. We also make it ourselves frequently for special dinners, though I admit we sometimes cheat and use purchased raspberry vinaigrette ourselves, if we are running short on time. Look for a dressing with a high ratio of raspberry puree if you’re buying it at the store. Mix together celery and avocado in a medium bowl. Mix together dressing ingredients and beat until well mixed. Stir dressing into veggies and toss well. Transfer to a serving bowl and sprinkle top with pomegranate seeds. Mix together salad ingredients, mix together dressing, stir all together. Yum! Note: I’ve also done a variation of this with pomegranate seeds instead of the cranberries and walnuts. They give crunch and sweetness both and will make it more suitable for those with nut allergies.